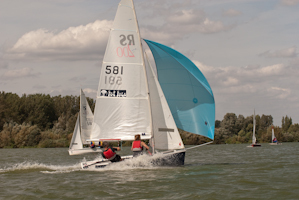 Middle Nene Sailing Club is a very friendly, enthusiastic sailing club, sited in Northamptonshire, offering good sailing, competitive class racing, training courses, and a varied social calendar. The club is entirely run by its members. We enjoy a constant water level, and allow sailing at any time from March to December, with racing organised on Sundays, Saturdays, and Thursday evenings. 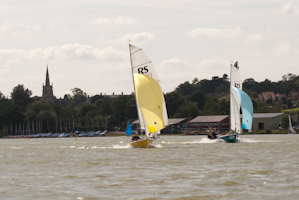 Class and Handicap racing are strong features of this club, and include dinghies such as RS200, GP14, Enterprise, Solo, Laser, RS Tera, National 12, Topper, Mirror and Optimist as well as two keelboat classes - Flying 15 ('Classic' and 'Silver' fleet boats) and Illusion. Please check with the Membership Secretary which other classes will be accepted into the Menagerie Fleet. Excellent facilities are provided, and include a licensed bar, professional catering, showers, changing rooms, camping on site, together with frequent and varied social events. A comprehensive range of training courses is available and we welcome beginners and experienced sailors alike. 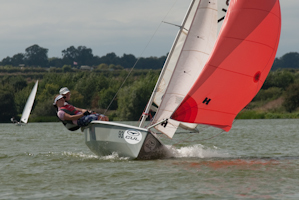 Middle Nene Sailing Club, now in its 70th year, was one of the first sailing clubs to be established in Northamptonshire. When sailing started here at Thrapston Sailing Lake, or the gravel pit as it was then, the water was about one third of its present size, and sailors had to contend with the occasional barge carrying gravel from the Aldwincle end to the works at Thrapston. By 1960, a further gravel pit had been worked out between our pit and the river, greatly extending our sailing water. The two pits were separated by a bank topped by a hedge, with a channel either side to enable members to sail from one pit to the other. The club steadily grew in numbers and prestige, and we can number World and National Championships among the achievements of our members, as well as Open Meeting successes too numerous to mention. In 1992, following years of patient negotiations, the Sailing Club Members purchased the site along with some 182 acres of water and surrounding land. This was a major and very far-sighted achievement, and provides real benefits in controlling costs, and enables us to take a much longer term view in planning. One of the immediate benefits was to be able to provide vehicular access from Thrapston directly to the club car park. Following steady pressure from members, a major project was mounted in 1996 to remove the gravel bank separating the two gravel pits. This was (eventually) successful and means we now have about 140 acres of open, unrestricted water on which to sail. The club is very well equipped for the dinghy sailor, with the almost unique feature of a constant water level, and advantage of being able to board or disembark from fixed stagings without getting wet feet! Slip ways are provided and a beach is available for Lasers and Sailboards. There is laid out berthing for more than 200 dinghies, and moorings in the form of a "marina" for Flying Fifteens. Changing rooms are well equipped, and hot showers and lockers are provided. The club has its own licensed bar which is open during programmed sailing days, and organised social evenings. The Refreshment bar is open during the season serving hot and cold meals on Sundays and snacks on Saturdays. Members may also use the galley facilities if it is not manned. The House Committee provides an excellent and varied social programme with entertainment to suit most tastes. Camping and caravanning in the top paddock is allowed on these specific nights and during extended sailing programmes, and at other times by arrangement. Dinghy classes accepted are: Optimist, Topper, Mirror, 420, Laser, GP14, National 12, Solo, Enterprise, RS 200 plus a restricted number of other classes in the menagerie, plus Sailboards. Keelboat classes are "Classic" / "Silver" Flying Fifteen (Sail Nos. below 3400) and Illusion. 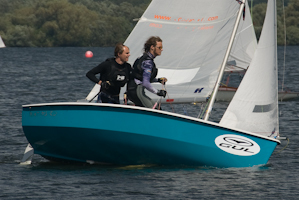 A full race programme is organised by the Sailing Committee, staffed by members on a rota basis. Races are run on Sundays from mid - March to the end of December, and additional race programmes are run on Thursday evenings and Saturday afternoons from late April through to the autumn. Rescue facilities are also provided on some Tuesday evenings during the summer months for our family nights for members just wishing to cruise or learn to sail. The club has its own Training Committee with qualified instructors and helpers. Structured courses are run throughout the year for adults and juniors from basic sailing through to racing. Safety is a high priority at Middle Nene SC, consequently we have our own RYA qualified Power Boat instructors. New and existing members are encouraged to become proficient in the safe use of the club's rescue craft by attending one of the many courses run throughout the season. For the less energetic water enthusiast, angling membership is available, providing angling from our surrounding land, or social membership. The club also has picturesque walks and a bird sanctuary within its environs. The day to day running of the club and the facilities available to members, have been provided by, and are fully maintained by voluntary labour, sourced entirely from within the membership.